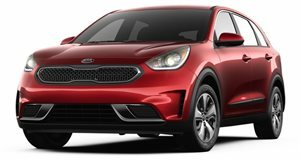 The new 2017 Kia Niro is available with a front-wheel drive 139 hp gasoline/electric hybrid drivetrain, an efficient 6-speed dual-clutch transmission makes the most of the combined 195 lb-ft of torque on offer. Economy is excellent although dips if you opt for the top Touring trim. Standard features such as Apple CarPlay/Android Auto and rearview camera are complemented by a decent list of optional safety features although not on the base FE trim level. The Kia Niro is an all-new model for 2017 and steps up to do battle in the compact hybrid crossover SUV class. 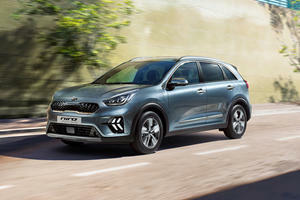 Thankfully Kia has not found it necessary to make too much of a fuss about its hybrid credentials and the Niro looks much more like a traditional vehicle than some of its rivals. It is also one of the smallest compact crossovers around, riding not much higher than a hatchback, so let’s see whether Kia’s new entrant hits the spot or misses the point. The dashboard and instrumentation layout is logical and fuss-free and the seating for both front and rear passengers is comfortable enough although you may get some complaints from the person in the middle on longer journeys. Oddments space could be better and while overall quality is good, some plastic trim pieces are hard to the touch and not quite up to par with some rivals. The Niro doesn’t skimp on interior options though and it is good to see that smartphone connectivity is standard across the range. The Niro sits slightly taller than a traditional sedan and those stepping out of one will notice the elevated driving position but shoppers used to taller SUVs may feel it is a bit on the low side. The battery pack is located under the rear seat which doesn’t compromise on rear space but the Niro’s small dimensions do compromise the cargo space. With no all-wheel drive option and ground clearance much the same as a standard sedan it is clear that Kia do not intend this SUV to head too far off the beaten track. 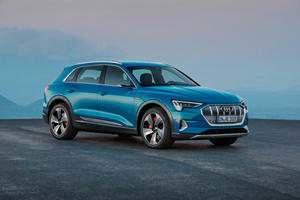 Good thing then that it acquits itself well to city driving, the unobtrusive electric assistance cuts in and out imperceptibly, generally helping out the inline-4 engine whenever extra acceleration is required. The ride is comfortable too on the standard 16-inch wheels and handling is much like the upsize compact hatchback that it is. 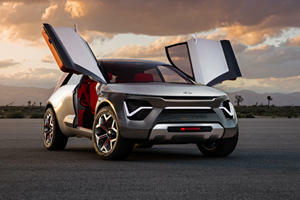 Kia claims that the 1.6-liter inline-4 produces 104 horsepower with an additional 43hp offered up by the electric motor. In Kia math this equates to a combined total of 139 hp and in general usage it powers the light Kia along at a decent pace. Torque ratings are 109 lb-ft and 125 lb-ft for the gasoline and electric motor respectively. This combines to provide 195 lb-ft and contributes to nippy off-the line acceleration. The dual-clutch 6-speed transmission mainly tries to keep the revs low in ECO mode but is appreciably quicker in Sport mode. The focus here is on economy though and the Niro can return a claimed 50mpg. Bear in mind though that higher spec models are slightly less efficient. The Niro comes in 4 basic trim levels. With the base FE equipped with, Apple CarPlay and Android Auto functionality as well as Bluetooth connectivity. A 6-speaker sound system, cruise control and a rearview camera as well as a 7-inch touch screen round-off the more notable standard features. LX trim adds keyless entry, folding rear centre armrest and luggage board. Unlike the FE you can also choose front fog lights, LED daytime lights and a leather-clad steering wheel as options. You can also add Forward collision warning, lane departure warning and autonomous emergency braking to the safety devices from this trim level on. The EX trim level includes all LX items and adds a blind-spot monitoring system, cargo cover, leather/cloth upholstery, and power folding and heated exterior mirrors and a leather covered steering wheel. The Touring trim adds 18-inch wheels, parking sensors all-round, sunroof, full leather upholstery and an 8-inch touch screen. The sound system also receives two more speakers and satellite radio functionality. A wireless mobile charger and 110v inverter are unique options to the Touring. A limited Touring Launch model adds to the EX trim with a few additional items from the top Touring spec model such as 18-inch wheels and enhanced touch screen and is available in two unique colours. A compact and efficient crossover, the Niro offers modern design and technology in a competent package. Its slightly raised layout and capable drivetrain make for a great city cruiser but look elsewhere if all-wheel drive and large cargo capacity is a priority. Can you guess which body style they share?